I’m not much of a donut eater ( I know…gasp), but my kids certainly love them. My daughter gets so excited when we drive by Krispy Kreme and the hot donut sign is on. I cringe knowing how much saturated fat and sugar is in those fried balls of dough, but I still allow them a treat, on occasion. I believe in moderation and enjoying a decadent splurge every now and then. It makes for a healthy relationship with food. 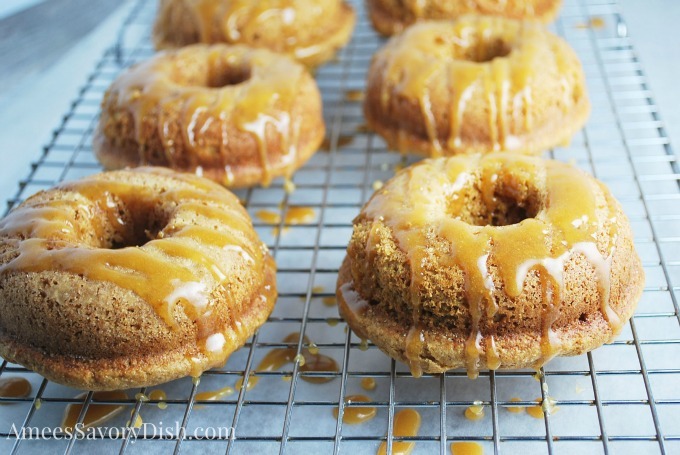 I wanted to make a healthier version for a breakfast treat that would still taste delicious, so I created these healthier baked maple donuts adapted from a favorite Ina Garten recipe. I replaced most of the fat in the recipe with Siggi’s skyr yogurt, applesauce and extra virgin olive oil and baked them instead of the traditional frying method. For the glaze, I went for a drizzle instead of drowning them in icing. It’s made with natural maple sugar, which has a rich maple flavor, so a little goes a long way. The glaze adds the perfect amount of sweetness. 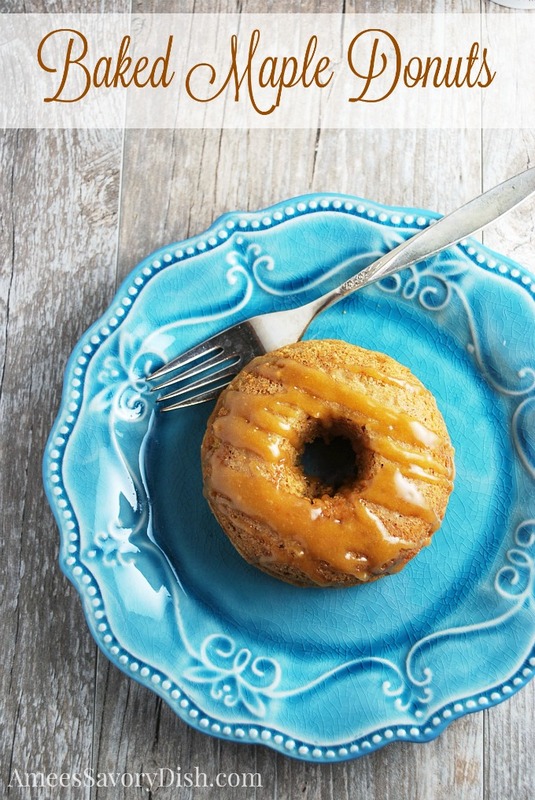 These healthier baked maple donuts are a guilt-free indulgence. I would know, because I’ve already eaten two. I should probably save some for the kids. Grease a donut pan and sprinkle with extra flour to evenly coat all sides of the donut molds. 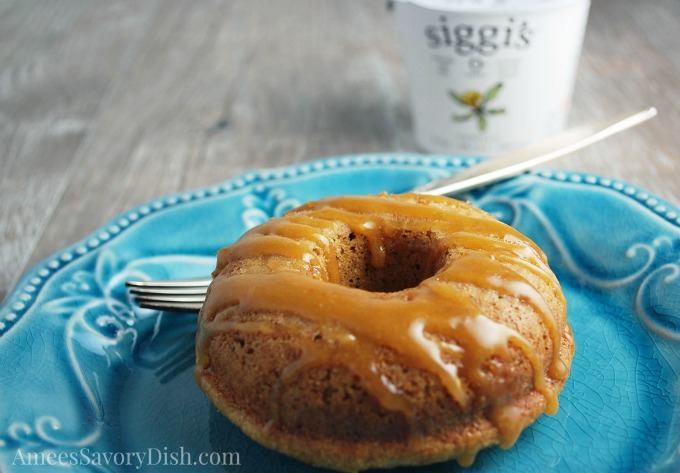 My friends at Siggi’s Dairy have offered to giveaway a month’s supply of their delicious skyr yogurt to one of my readers! Be sure and leave a comment on how you would enjoy your Siggi’s skyr yogurt, whether it’s topped with your favorite fruit, nuts, seeds or parfait ingredients or in a recipe creation to replace some of the unhealthy fats. Give me your best creative ideas using Siggi’s Icelandic skyr yogurt and I may reshare some favorites or even create them for the blog! You can tag me on Instagram and Twitter or in the comment section below. Your donuts look amazing! If I won SIggis yogurt I would use it in fruit smoothies. I would have Siggi’s yogurt in the morning before work. Ha ha! Me too, Anne! These sound amazing, a less guilty pleasure for sure! Oooh hoo – I always wanted to get a baked donut pan and finally “splurged” last year (it was only $5 at A.C. Moore) and then went on a baked donut baking tear. I haven’t made them in awhile so now it’s time to get baking again – pinning this recipe!! I would enjoy it with granola and fresh fruit. There’s no wrong way to enjoy siggi’s yogurt!! Love it just plain with a spoon.. but would love to try it in donuts like these!! I’d probably use it in a smoothie or top it with slivered almonds. Healthy donuts?! Sign me up! Pinned! Visiting via Wine’d Down Wednesdays! Thank you, Sonali! Yes, Siggi’s is the bomb!!! I love it straight up or mixed in recipes, too. It’s so rich and dreamy! Thank you for the recipe. It looks very easy to make but I don’t know if I can make the taste right but I will try! Love all images, they are beautiful! Love it! No really, I loved, I did it today for the first time and it turned out better than I thought. ^^!